FIRST PROGRESS REPORT OF THE CHAIRPERSON OF THE COMMISSION ON THE AFRICA CENTER FOR DISEASE CONTROL INTRODUCTION 1. This report is submitted as a follow-up to the pledges I made during the Joint African Union (AU) Commission – Permanent Representatives Committee (PRC) Retreat, held in Cairo, Egypt, from 10 to 11 December 2017, and the interaction I had with the PRC on 7 March 2018. The report covers issues relating to the establishment and governance structure of the Africa Centre for Disease Control (Africa CDC), as well as the activities undertaken, including challenges encountered. It concludes with recommendations on the way forward. 1. This report is submitted as a follow-up to the pledges I made during the Joint African Union (AU) Commission – Permanent Representatives Committee (PRC) Retreat, held in Cairo, Egypt, from 10 to 11 December 2017, and the interaction I had with the PRC on 7 March 2018. The report covers issues relating to the establishment and governance structure of the Africa Centre for Disease Control (Africa CDC), as well as the activities undertaken, including challenges encountered. It concludes with recommendations on the way forward. 2. Africa is facing a triple burden of disease, namely, communicable diseases such as HIV/AIDS, tuberculosis and malaria; non-communicable diseases; injuries and trauma. Public health events like the West Africa Ebola Virus Disease outbreak, which claimed over 11,000 African lives (2014-2016), cholera outbreaks, which have affected southern, central, and eastern Africa in recent years, and other natural disasters, such as the devastating mudslide in Sierra Leone, in which over 1000 people died (2017), are pressing concerns. In the first three months of 2018, 43 ongoing outbreaks occurring on the African continent have been reported by the World Health Organization. In 2016, over 1 million new HIV infections were diagnosed in Africa. Each of these diseases or events impact significant numbers of Africans, have the potential to reverse fragile economic gains (the Ebola outbreak resulted in USD 2.2 billion in gross domestic product losses for Guinea, Liberia, and Sierra Leone), and may ultimately become global security threats. 3. Globally, the emergence and re-emergence of infectious diseases with pandemic potential is gaining widespread attention. Over the past three and half decades, at least 30 new infectious agents affecting humans have emerged, most of which are zoonotic. The origins of these agents have been shown to correlate significantly with socioeconomic, environmental, and ecological factors, particularly trends in urbanization and population growth (Africa’s population is expected to increase from 1.2 billion to 2.4 billion people by the year 2050). Additionally, the widespread use of medications has created an enormous threat due to emerging antimicrobial resistance. 4. Agenda 2063 emphasizes the need to view health as a development issue if the continent is to prosper and achieve its objective (Aspiration 1, Goal 3) that citizens are healthy, well-nourished and have long lives. The Africa Health Strategy (AHS 2016-2030), an overarching framework that guides Member State implementation of health policies. The strategy highlights Africa Centre for Disease Control and Prevention role in disease prevention, surveillance, emergency preparedness and response. 5. The AU Special Summit on HIV, TB and Malaria, which was held in Abuja in July 2013, took cognizance of the need for an Africa Centre for Disease Control and Prevention (Africa CDC) to conduct life-saving research on priority health problems in Africa, and serve as a platform to share knowledge and build capacity in responding to public health emergencies and threats. 6. 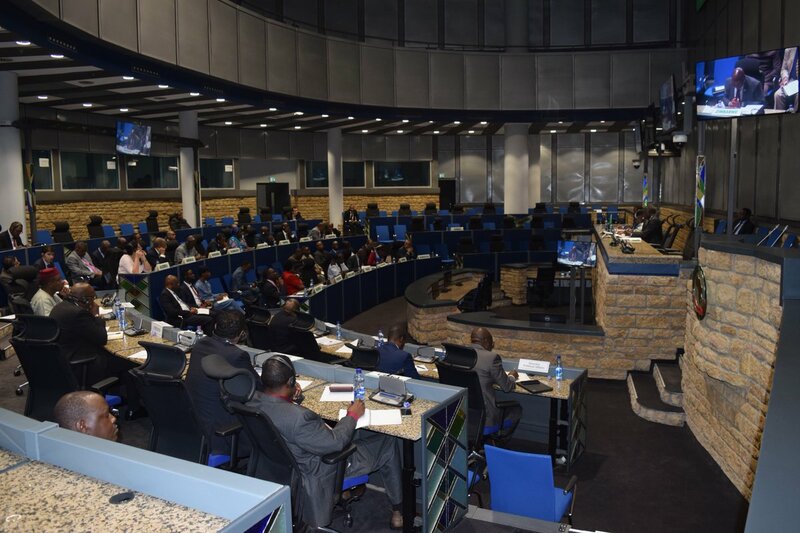 Subsequently, the Assembly, during its 22nd Ordinary Session, held in Addis Ababa in January 2014, adopted the decision Assembly/AU/Dec.499 (XXII) that emphasised the urgency of establishing the Africa CDC and requested the Commission to submit a report in January 2015 that will include the legal, structural and financial implications of the establishment of the Centre. During its 24th Ordinary Session, held in Addis Ababa in January 2015, the Assembly adopted decision Assembly/AU/Dec.554 (XXIV) by which it endorsed the establishment of the Africa CDC. The Statute of the Africa CDC and its Framework of Operation were approved at the Assembly’s 26th Ordinary Session, held in January 2016, and the Africa CDC was officially launched on 31 January 2017. The Africa CDC Five-year Strategic Plan was officially launched in March 2017. 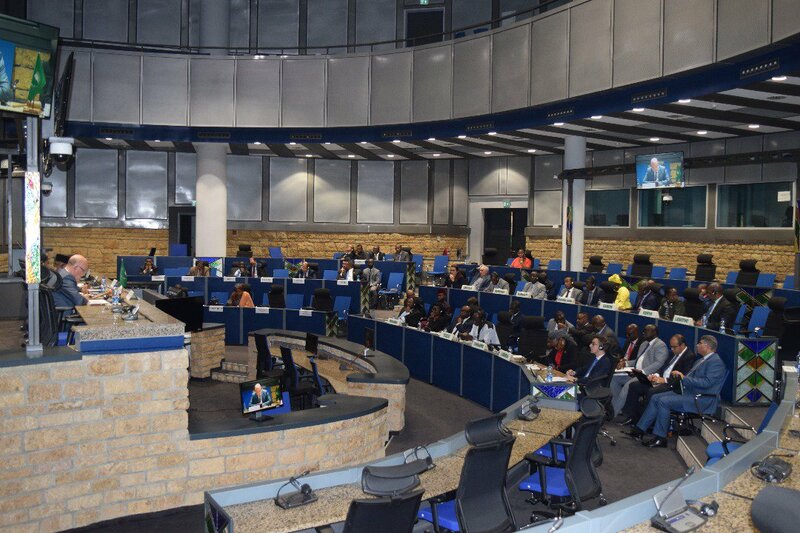 During the 28th Ordinary Session of the Assembly held in January 2017, approved the permanent governance structure and corresponding policy manual of the Africa CDC. 7. Staff recruitment commenced in mid-2017 for permanent and contract-based positions within the scientific and administrative divisions of Africa CDC. Additionally, in cooperation with the Commission’s Department of Human Resources Science and Technology, thirty-five (35) African Youth Volunteers were recruited to provide support to various technical and administrative components of Africa CDC’s Secretariat and Regional Collaborating Centres in eastern and southern Africa. 8. The establishment of Africa CDC Regional Collaborating Centres in Central, Eastern, and Southern Africa progressed substantially during 2017. Representatives from Africa CDC Secretariat visited all five geographic AU regions to secure cooperation in three key areas: RCC Governance Structure, Framework of Coordination and Operations, and the priority technical areas. During the same period, each of these regions has concluded the AU host country agreements. Recruitment of their respective coordinators is ongoing. The operationalization of the Northern and Western Africa CDC RCC is progressing more slowly. 9. Africa CDC worked closely with the RCCs to identify an initial cohort of public health professionals who would be part of the Africa CDC Mobile Response Teams and would be deployed as Africa CDC’s first responders to Member States’ request for assistance during public health events. 10. Since its establishment, the Africa CDC has made commendable achievements, as outlined below. 11. Africa CDC has begun producing weekly reports that summarize public health events detected through media and informal public sources. In 2017, over thirty (30) such reports were prepared by the Africa CDC epidemiologists. The reports provided some of the earliest signals of possible disease outbreaks that may negatively affect public health and the wellbeing of African citizens. 12. Also in 2017, the Africa CDC launched its Anti-Microbial Surveillance Regional Network (AMRSNET), which is part of the Regional Integrated Surveillance and Laboratory Network. AMRSNET provides a unique opportunity for networking among Member States and other international stakeholders, including the World Health Organization (WHO), to make sure that medicines used to fight communicable diseases remain effective. AMRSNET will serve as a mode of communication and collaboration between Member States and relevant Departments in the AU Commission and other AU entities. · Africa CDC response: Three experts were deployed to assess the national response and support partner coordination. After the outbreak was brought under control, Africa CDC then mobilized 14 volunteers to lead post-Ebola monitoring and enhance cross-border surveillance in the areas of South Sudan and the Central African Republic that bordered the affected Likati health zone in DRC. · Africa CDC response: Two experts were deployed to assess the national response efforts and identify gaps and challenges. The experts also prepared training materials on how to control the outbreak. Additionally, Africa CDC contributed USD100,000 to the Government of the DRC to support cholera response activities. · Africa CDC response: Africa CDC assisted in incident management and provided support in laboratory capacity development. · Africa CDC response: One expert was deployed to examine malaria data, look for patterns that would explain malaria surge, refine the criteria by which Mozambique can declare a malaria outbreak, create a malaria monitoring dashboard that would provide national officials and technical experts with rapid snapshots of the current malaria situation. · Africa CDC response: One expert was deployed to support the creation of malaria posts in border regions. · Africa CDC response: Two experts were deployed to examine lassa fever data, and look for patterns that would identify people at higher risks of infection and advise the national authorities accordingly, as well as support Nigerian federal states in assessing their own readiness for emergencies. · Africa CDC response: At the request of the Nigeria Centres for Disease Control, two Africa CDC experts provided technical support to address the meningitis outbreak. Their specific contribution was to examine meningitis data and look for patterns that would explain which people were at highest risk for meningitis infection; to create a meningitis monitoring dashboard that would provide national officials and technical experts with rapid snapshots of the current meningitis situation; to strengthen functions of the Nigeria CDC emergency operations centre at national and sub-national levels; to assist in the review of the strengths and weaknesses of the Nigeria meningitis response in order to prepare for future outbreaks; to propose a team structure and treatment guidelines for the doctors, nurses, and other responders who were supporting meningitis patients. · Africa CDC response: Two experts were deployed to help the national authorities enhance the measures to prevent and control any likely disease outbreaks among displaced people, support hygiene and sanitation education in affected communities, set up disease detection systems to monitor for fever, diarrhoea and respiratory conditions in affected communities. 14. The launch of the Regional Integrated Surveillance and Laboratory Network (RISLNET) has seen early success in its ambition to link African laboratory assets to the needs wherever they may arise on the continent. Côte d’Ivoire’s Institute Pasteur provided diagnostic support for diagnosis of monkey pox virus in Sierra Leone. 15. RISLNET also plans to become the continental platform to implement next-generation sequencing and advanced molecular diagnostics, event-based and antimicrobial resistance surveillance, pandemic preparedness plans, and prevention and control for neglected tropical and non-communicable disease. 16. Africa CDC also strengthened its partnership with the Africa Society for Laboratory Medicine by developing a strategy for mapping African laboratory capacity. It also identified a pathway for building continental and regional capacity for advanced molecular diagnostics and multiplex pathogen assays. 17. Through the RCCs, the Africa CDC launched a platform to facilitate weekly discussions on regional public health issues between Member States. The weekly sessions, particularly in Southern Africa, have succeeded in allowing informal notification of outbreak events taking place in neighbouring states. · United States: The United States Government has provided over USD 10 million of in-kind contributions to the Africa CDC (ten African epidemiologists; three permanent US Government advisors; USD 3 million for a public health emergency operations centre; USD 600,000 for regional information exchange platform). 20. Additionally, coordination between Africa CDC and the World Health Organization (Africa Regional Office) continued to deepen, notably through joint hosting of the first Emergency Response Coordination Meeting between the Africa CDC, Global Outbreak Alert and Response Network, and the WHO Africa Regional Office in Dakar, Senegal (18-20 July 2017). 21. In July 2017, the Heads of State and Government made a declaration [Assembly/AU/Decl.3(XXIX)] on accelerating the implementation of international health regulations at national, provincial and local levels with a clear road map and monitoring mechanisms. They also committed to putting in place multi-sectorial mechanisms to accelerate the implementation of international health regulations through the mobilization of necessary resources. Africa CDC is working with Member States, WHO and other stakeholders to provide support and monitor the adherence to international health regulations. 22. At this time, Africa CDC’s fulfilment of its mandate is hampered by small numbers of permanent staff supporting administrative functions at the secretariat. The majority of Africa CDC support currently comes from seconded or contracted staff. Efforts are underway to address these challenges. 23. Africa CDC has succeeded in developing bilateral partnerships with several nations outside the African continent. Within AU Member States, only the Republic of Kenya has provided a voluntary contribution of USD 1 million to support the Africa CDC. Sustainable support among Member States is critical for sustainable growth and expansion of Africa CDC. 24. Africa CDC is pursuing a mechanism for sustainable financing through businesses, the private sector, and African philanthropy. The Africa CDC private sector and philanthropy engagement strategy has been developed and presented to the Africa CDC Governing Board. This strategy has been aligned and coordinated with plans for Africa CDC Foundation. A priority focus has been on identifying African companies dealing in telecommunications and other sectors. Finally, Africa CDC is engaging African philanthropists who have given historical support to the African health agenda. 26. Member States have demonstrated their continued support and enthusiasm for Africa CDC by robust participation to produce various framework documents that will guide their public health activities at the national level. These framework documents include a strategy to introduce event-based surveillance at the continental, regional, and national levels; a framework to establish a national public health institute in every Member State; a framework to address the threat of antimicrobial resistance. 28. While three of the Africa CDC RCC have had successful political launches, they require substantial human resource support to ensure that the technical aspects of Africa CDC’s strategic plan is successfully implemented at the regional level. Without each RCC, Africa CDC has limited ability to encourage public health coordination among Member States. It is crucial to ensure that the West Africa and North Africa are launched in 2018. I look forward to nominating a North African technical public health institution motivated and equipped to provide support to the entire region, cognizant of the diverse array of needs represented in North Africa.